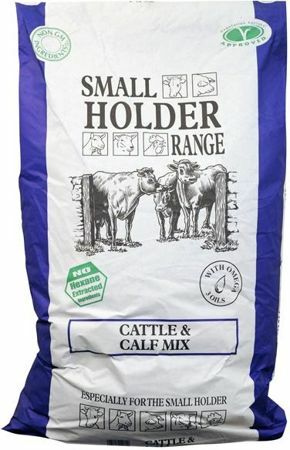 The Smallholder Range Cattle & Calf Mix is an appetising mix suitable from weaning onwards. Grass, hay or silage will form the basis of the diet. In winter you should allow at least 5-9kg of hay each per day for adult cattle. Additional hay may also be necessary in dry summers when grass is limited. Make any changes slowly and introduce concentrate feed gradually. It is usual to split the total amount into two or three feeds. Feeding calves – start by introducing small quantities (115g) of Cattle & Calf Mix, gradually increasing to about 1.3kg at eight weeks of age. From five weeks onwards Calf to Cattle Pencils may be fed as an alternative to the mix. Quantities of mix or pencils can be steadily increased to 2.3kg at six months. Feeding young cattle – youngstock should not be allowed to become fat, but may need up to 2.5kg of Cattle & Calf Mix or Calf to Cattle Pencils per day to keep them in good condition. Fattening bullocks – introduce Calf to Cattle Pencils from the age of about 12 weeks onwards. feed from 1.25kg a day to 3.5-4.5kg for older animals. Dairy cattle – feed 1.5kg of Cattle & Calf Mix or Calf to Cattle Pencils for every 4.5 litres (1 gallon) of milk produced. Each cow’s diet should be adjusted to suit the individual, according to the time of year, the nutritional value of grass and time of calving.